Should Facebook Have a 'Panic Button'? Facebook wants to make the Web more social, and in the process increase the information you're willing to share. That was the takeaway from founder Mark Zuckerberg's keynote address at Facebook's F8 developer conference on Wednesday, when the company rolled out a suite of new products it says can change the Web as much as the hyperlink did. Currently, it's challenging for websites to know anything about you, your interests or your friends. That's good in some ways  privacy, for one  but bad in others: short of having, you know, a conversation, it's tricky to share with your friends what you're interested in and discover what they like too. Facebook's Open Graph (the collective name for the products announced at F8) seeks to change that by, in essence, serving as an overarching, personal layer on top of the Web by incorporating your friends, interests and activities. Pages making use of Facebook's new technology aren't static: they know who you are, what you like and what your friends like. 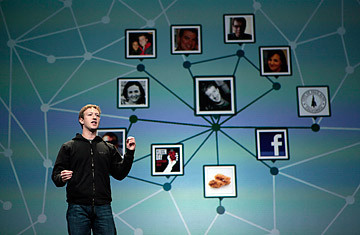 "We are building a Web where the default is social," Zuckerberg said. It's a bit confusing in principle, but it's simple in implementation. Facebook wants all Web pages to have its "Like" button, which it released at the conference. (TIME.com implemented the buttons in advance  you can see one at the top of this page.) Each time you indicate that you like something, that information is fed back to Facebook and then to the website you're on. If enough of your friends like the same restaurant on Yelp, you'll see that on Yelp and when you log in to Facebook. Like this article? Click the button, and your friends may see your recommendation when they visit TIME.com. This isn't completely a new idea, and it makes sense intuitively that if your friends like something, odds are, you'll be interested in checking it out. But Facebook has the mass and the technology to reach the entire Web. The company has more than 400 million users, and implementing the "Like" functionality requires just a few lines of code. Don't be surprised when you start seeing the buttons and your friends' pictures everywhere you go on the Web. It's a disquieting notion for those critical of Facebook's privacy record. The company is already under fire in Germany for relaxing its privacy settings, and faces frequent complaints to the FCC about how much user data it surfaces. But for his part, Zuckerberg says there's no privacy change that comes with Open Graph: users have to click on a "Like" button for Facebook to learn anything about their preferences, and they still have the ability to select who is able to access this information. But it's easy to see the potential windfall Facebook stands to make. The company already has a highly developed advertising platform, allowing advertisers to target users in narrowly defined demographics, like 20-year-old female juniors at the University of California, Berkeley, for example. If Facebook is suddenly able to tap into your preferences as well, the platform could be that much more powerful. While the company was tightlipped on any monetization plans going forward (no changes to the ad platform were announced), it could soon have the ability to target advertisements more narrowly than anyone else. Whether it actually will remains to be seen. Another thing missing from Facebook's presentation was any talk of extending the Open Graph concept to the offline world. Despite the massive growth of location-based social sites like Foursquare and Gowalla and the heavy emphasis on attaching location to tweets at Twitter's Chirp conference last week  its version of Facebook's F8 conference  Zuckerberg did not mention any plans to incorporate map data into status updates or user data anytime soon. But a potential clue to the company's plans was tucked into the registration material for F8. Each attendee received a plastic badge with radio-frequency identification, which they could use to post their location at the conference to Facebook, in a nifty application dubbed "Facebook Presence." Is this the company's next big thing? For now, it's one of the few pieces of information that even Facebook wants left off the grid. See five Facebook no-nos for divorcing couples.